What is Aquamarine? Where can you find it? Aquamarine is light sky blue to dark sea blue color gemstone which is a symbol of sympathy, faith and of friendship and is the official birthstone for ‘March’. Aquamarine is a Latin word which means “water of the sea”. It comes under the beryl family and made of iron and other chemicals which is responsible for its sea blue color. This chromium-rich gemstone has a 7.5-8 hardness on Mohs scale . The Aquamarine and Emerald gemstones both are beryllium and contain aluminum and silicate mineral but are very different as a price and market point of view and the iron impurities of Aquamarine are the reason. Both the Emerald and Aquamarine share many properties (same RI and specific gravity) but the clarity and transparency level is quite different. Emerald comes with lots of inclusion to clear quality and Aquamarine comes mostly clear and transparent in faceted gem quality. A dark and deeply saturated sea blue color is the most desirable. Read more about this in the next section. World-Famous Aquamarine – The ‘Dom Pedro’ was the biggest Aquamarine ever discovered and cut by a Germany based designer Bernd Munsteiner weighing 26 kg and cut and faceted in Idar-Oberstein. 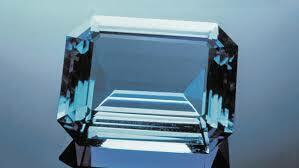 Quality parameters in Aquamarine Gemstones are different from other gems. Color plays an important role in this, as it comes in pale blue (almost white) to sea blue color, please see the color chart below. You’ll find that It is very difficult to find a gem quality (sea blue) Aquamarine. Top quality Aquamarine comes from Brazil (the Santa Maria de ltabira mine) and which is very high in price. Aquamarine is one of the favorite stones of many designers. It comes in three different shades – Green, Grey and Blue (blue preferred most). The top shade of Aquamarine is the ‘Santa Maria’ color which is close to the Sky Blue Topaz color and this color is also high in price. 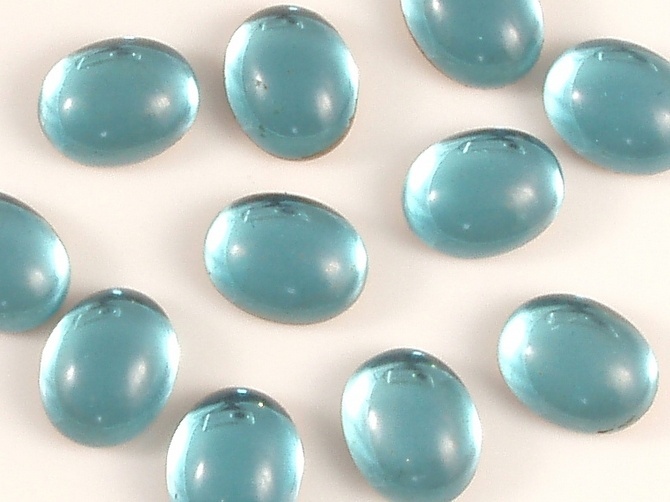 Aquamarine Cabochons are mostly made with milky material. Commercial Aquamarine cabs come with inclusions and low transparency. Sky Blue Topaz quite resembles aquamarine but Blue Topaz is an irradiated gemstone and Aquamarine is completely natural, not even heated and that’s why it is becoming famous among users and designers even though Sky Blue Topaz is much cheaper in comparison to this stone. We are a manufacturer with our own factory producing a lot of Aquamarine on a daily basis. Most of our customers for Aquamarine gems come from The UK and the United States. This Semi Precious Gemstone is an ordinary gemstone and can look extremely unique and wonderful when put into jewellery. The chart above shows the different qualities of Wholesale Aquamarine Gemstones which we have in our stock. The Top Color is Grade Gem, or in other words Santa Maria color. This one is very expensive, but again you cant find a replacement for Aquamarine, which is a natural gemstone. Be assured our Aquamarine is 100% authenticated, and comes with certificates if required, for big sized nice gems. Shapes: Aquamarine is found in all shapes. Cuttings: If there is anything special you want, let us know! Prices for Aquamarine: Normal sizes can vary from $1 US to $40. However, sizes and quality may change the price significantly. Please click on Contact Us icon on the top of the page for more details about delivery, punctuality, photos of our Aquamarine, etc. Here from our YouTube Channel is a video to see Color Grading first hand. We have been manufacturing in different qualities of Aquamarine. As we mentioned above that top quality material is found in Brazil however other mines are in North Carolina, and Colorado, in the United States and also in Africa. We have our sources in Brazil and other countries and buy raw material in big quantities from there. This lowers our cost of manufacturing and ultimately it gives lower prices to our buyers so they can source from us. When we talk about Aquamarine jewelry and cabochons then we supply low commercial grade (Milky and pale color) to top notch (Nice blue and transparent) quality in smooth and faceted. Every cabochons that is manufactured by us is well polished, calibrated and crack free and we clearly inform our customers about what we will be supplying them because we don’t want to make our customers unhappy. We believe in long term business and that’s the reason we have been here in the gemstone market for last 20 years. Faceted stones are mainly used in rings, earrings and pendant by many small designers to big jewelry manufacturing companies. We mainly manufacture oval, round, cushion, trillion and octagons in both calibrated and free size. We have mentioned the color chart above for our customers’ reference. They can simply see the it and order with us. Why are Aquamarine Cabochons and Faceted Stones High in Demand? 100% Genuine Gemstone – Aquamarine is a completely natural stone, not even heated so this makes a difference from other gemstones and on the other hand, if we talk about any other stones of the same color then they are all treated or heated to enhance the color. Soft and pleasant color – Sky Blue Topaz comes in five times lower price than Aquamarine and in a much better color and transparency level but still people prefer Aquamarine because it’s a completely natural stone. It has become one of the favorite stones of Americans and Europeans because of its characteristics and soft color. Availability of all sizes – Jewelry designers are using this in their designs because it comes in different price ranges and in all small to big sizes so this makes it easier for them to choose their desired sizes and price range. Sometimes jewelers face problems in size because of low availability but when you are buying with us then you don’t need to face this because we avail all ring, pendant and earrings sizes. Now you don’t need to wait for prices for 1-2 days because we reply to you quickly with detailed information. Simply drop us an inquiry through Contact Us form or drop us an email mentioning your requirements.